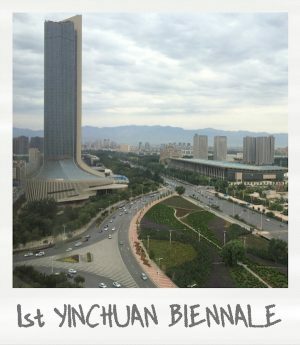 The First Yinchuan Biennale titled “For an Image, Faster than Light” opened to the public on 10th September 2016 at the Yinchuan MOCA. Situated amongst the expansive green fields and wetlands which surround the burgeoning city of Yinchuan, this museum is the first contemporary art institution to appear in North-West China. It constitutes a hard-to-miss visual pinnacle of the ‘River Origins’ artists’ community and development project, which opened last year. The slick, shiny exterior of this sprawling 15000 sq. m complex was designed by Chinese firm We Architech Anonymous. Its positioning in the capital of the Ningxia Hui Autonomous region will provide an anchor for the planned developments of Huaxia-Hetu Art Town, a colossal 18.8 sq. m development including a school, a theme park and an artist residency programme. This accelerated programme of development is not new to China, but the unusual regional and cultural context has triggered speculation as to its underlying motives. As applied to the Biennale, this delivers a perhaps more enlightening critique than the mass media’s overwhelmingly singular focus on the last-minute removal of Ai WeiWei from the Biennial’s program. The museum is owned and operated by the Ningxia Minsheng Group (under the auspices of new public-private partnership policy ‘build-operate-transfer’) who plan to invest US $5bn in the project over the coming decade. Corporate investment and master-planning has apparently embraced rather than bulldozed the rich tapestry of the region’s cultural history. It is home today to many indigenous Muslim minorities, particularly the Hui, of whom there is a population of around 10 million in greater China. Located along the ancient Silk Road, the area has a long history of cultural exchange with Asia and the Middle East. The city has already hosted the biennial China-Arab States Expo, which draws business and government representatives from 60 countries and is seen as key driver of the region’s future prosperity. It has long played a key role in-intercultural exchange, before the arrival of this international arts institution. How does the biennial then, a rather more ‘periodical celebration,’ come to play a role in the evolution of this complex cultural landscape? Beyond an effort in city branding, economic and social benefits are thought to accrue to the locales of such international art events over a longer period of time. This is often framed as placing the host city on the ‘global art map.’ Certainly, this implies cultural and commercial exchange – to which Yinchuan is no stranger – but it also implicates the creation of new audiences at home. The latter emerges within yet also despite larger-scale networks and its branding as a Sino-Arab cultural centre. As part of the biennial, several cultural events were held which targeted the local audience, including a series of public education forums. A music festival also followed the opening week celebrations. 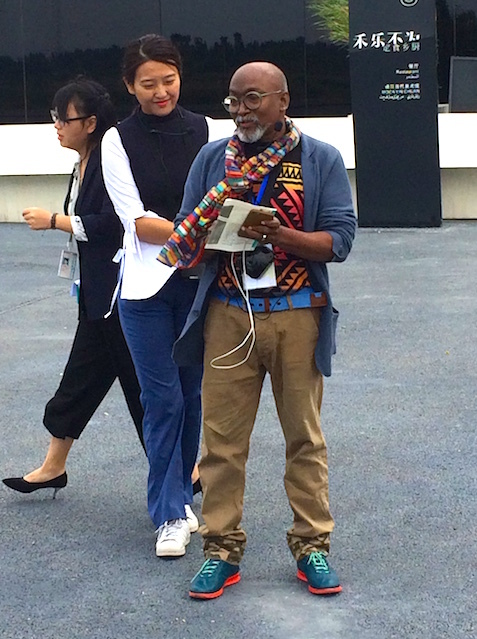 Krishnamachari’s presentation of an international array of artists within the unique context of MOCA Yinchuan as a prime gateway of Chinese and Islamic cultural exchange does not shy away from broader international connections, taken to define the biennale-as-event. He notes, “Yinchuan is an important point on the Silk Road, which stretches from the Mediterranean to the Pacific. Situated between the Yellow River and the Helan Mountains, it has experienced many cultural exchanges. It is a confluence of Chinese and Islamic culture, which can be seen in the architecture, food, people and traditional culture of the region. 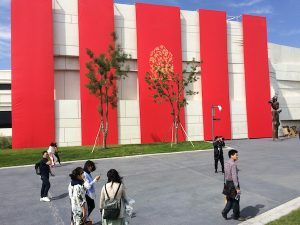 I hope that Yinchuan can become another major contemporary art center, alongside Beijing, Shanghai and Hong Kong.” The unprecedented and highly impressive fête of international artists brought together and thoughtfully displayed in the museum and its environs attests to this ambitious drive. 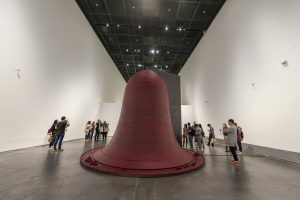 The long list of established artists includes: Anish Kapoor, Yoko Ono, Liam Gillick, Mary Ellen Carroll, Liu Wei, Cao Fei, Ivan Navarro, Santiago Sierra, Slavs and Tartars, Song Dong, Sudarshan Shetty, Basel Abbas & Ruanne Abou-Rahme, Jyoti Basu, Riyas Komu, Robert Montgomery, Khaled Sabsabi, Lisa Reihana, Valsan Koorma Kolleri, Yee I-Lann and Joana Hadjithomas & Khalil Joreige. The exhibition also featured several young and emerging artists including Alaa Mahmoud Alqedra, Abigail Reynolds, Dia Mehta Bhupal, Kartik Sood, Farzana Ahmed Urmi and Sushanta Kumar Maharana. Logistically, this was no small feat. 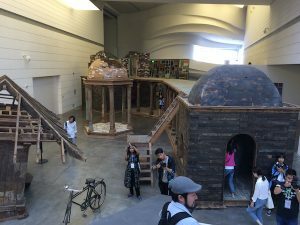 The immense challenges of staging an inaugural biennial at a venue determinedly outside China’s major coastal cities presented complications at all stages – from funding to installation, shipping, invitations, and promotions. Amongst the most embedded and poignant presentations at the biennale were the six artists-in-residence – the first batch of artists to occupy the artists village – which included Valsan Koorma Kolleri, Mohammed Kazem and Benitha Perciyal amongst others. The withdrawal of Chinese artist Ai Weiwei was put down to ‘pressure from above,’ positioned outside the internal organisational challenges facing the biennale. The ensuing global media attention points to the popularity of Weiwei outside mainland China, where he is often used as a cipher (or catch-all) for all that is perceived to be wrong with the Middle Kingdom. Although not officially participating, Weiwei’s presence was very much felt, whilst being conspicuously absent from conversations between artists and delegates at the opening. As the artist later posted on his social media, he was surprised that participating artists had not boycotted the event in protest against his exclusion. This rather misses the more complex form of change – in both perception and role of art in society – which biennial’s work to potentiate. Certainly, the project is situated within the not-entirely-unproblematic local context of expedited political and urban development, yet its execution is a testament to the resolve and drive of all those involved. It is a symbol of the potential of art as a catalyst for change, within the constraints of political forces ‘from above.’ The real challenge now for the Yinchuan Biennale is to continue with the promising work started by Krishnamachari and the museum staff, including the Suchen Hsieh, Artistic Director and Madam Liu, Director of MOCA Yinchuan.